Customers of Dutch bank ABN Amro can now connect a wide range of Mastercard-certified wearables to their bank account and use them to make both standard, low value contactless payments and also, by entering a PIN at the point of sale, higher value transactions beyond the contactless limit as well. ABN Amro is the first bank in the world to offer wearables that let customers make high value payments at the point-of-sale by using a PIN, the bank says. “ABN Amro’s website features products and links to the webshops where clients can buy wearables that come with Mastercard-certified payment chips. Their wearable product will be delivered to their home and, once activated via internet banking, can be used for contactless payment immediately. 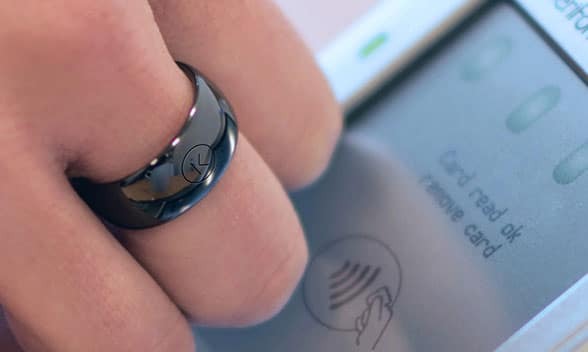 The rollout follows a 12 month pilot during which 500 ABN Amro customers have been testing out the use of NFC payments rings, watches, bracelets and keyrings. On average, clients taking part in the pilot made six payments a week for amounts under 25 euros, the bank reported in June.